According to NHIS (National Health Interview Survey) 52.5 million adults in the United States have been reportedly told by their doctor that they have some form of arthritis, rheumatoid arthritis, gout, lupus, or Fibromyalgia. 22.7% of adults have doctor diagnosed arthritis and a staggering 49.7% of adults 65 or older have been diagnosed with arthritis! Because there is no known cure for arthritis, you can only hope to lessen the pain through natural remedies (acupuncture, diet, exercise, physical therapy, etc.) and medications (Celebrex and steroid injections). If you’re looking to supplement a medication, or you are trying to stay all natural, Two Old Goats makes a lotion/creme that is effective for many individuals suffering from mild forms of arthritis and Fibromyalgia. Made from a goat milk base, the lotion provides a natural moisturizer with a non-greasy feel. It is infused with a collection of essential oils known for their anti-inflammatory qualities. Relief is noticed instantly, and daily applications begin to have a cumulative effect! 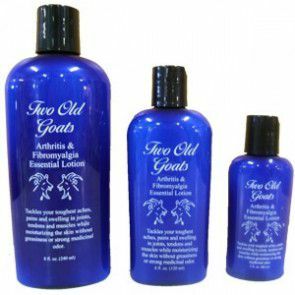 In addition, Two Old Goats is great for your skin too, contains no dyes or perfumes, and is alcohol free! If this sounds like something you would like to try, we stock the 2oz ($5.99), 4oz ($9.99) and 8oz ($17.99) bottles at Rolliers. Stop in today. Our full selection is available at the housewares service desk. NOTE: We had some of our employees try the creme that suffer from arthritis and the general consensus is that it is effective for individuals suffering from mild forms of arthritis, but not more debilitating states.